Hello folks I am a 10 year paraglider pilot, and I also paramotor. I very much want to start pursuing my A license this summer. I am 6’2” and a healthy 240 pounds. I could probably lose 20 pounds but I would prefer not to if I don’t have to. I am a healthy person. I am a firefighter for a living, and pass our fitness test annually with ease. I have noticed that most of the people in the skydiving sport are generally small folks. However, I have an amazing itch to join your family. Any advice for my large stature, pertaining to Gear, and the training? Also, I have thick skin so let it fly. You're size shouldn't be a problem at all. Most schools have student gear with adjustable harnesses. Choose a school that can provide you with a 260sqft or larger canopy. Preferably a 290. As a paraglider pilot you're probably familiar with wing loading. Ideally, student wing loading's should be .85 pounds per square foot of canopy. (0.85:1) You're "exit weight" will be most likely be 265+ once your're all geared up. You're instructor will be able to advise you accordingly. Just ask about your weight. It may or may not be an issue depending on the school. Each will have their own student weight limit. Some gear (harnesses, emergency parachute) is only certified to 254 lbs for example, and that's person plus all their gear. That used to be a common standard, which also means that plenty of people technically overloaded their gear. But nowadays there is more gear that's rated to a higher value, so ideally you would find a place that has such gear. 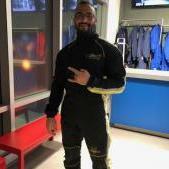 When I got into Skydiving I was 225 and like you was healthy and active individual and have no problem with physical fitness. What i found hard tho was being nimble and agile enough in the air. I got into a little yoga and dynamic stretching to help, seems to do the job. I also dropped weight to find gear to fit me. I am 6’2” and a healthy 240 pounds. I could probably lose 20 pounds but I would prefer not to if I don’t have to. I am a healthy person. I am a firefighter for a living, and pass our fitness test annually with ease. Really shouldn't be a problem. Check around with some of the local DZ's. In many cases these days; DZ's have a Max weight rig of 300# on hand for us bigger guys. Your background in paragliding would be a big plus for me. I do a tiny bit of yoga, but I’ll surely step it up now. Any recommended routines, YouTube, vids, etc? For Yoga I just do the gym classes they offer and I try and replicate some of the poses at home. Stretching, I googled mobility stretches and dynamic stretching and follow that as well. I think a great video series is AM & PM Yoga for Beginners with Rodney Yee and Patricia Walden, produced by Gaia. They are both about 10 minutes long plus a 5ish minute meditation; short, simple but helpful. They give suggestions on how to do the poses when you have difficulty getting all the way into a position. Just don't push yourself to hard, especially in the beginning. More is not better and trying to do a pose in a way that your body is not ready for can cause injuries, so listen to your body. There is a difference between your body struggling to maintain a pose and pain from holding a pose wrong or pushing to much to get more of a stretch. Yoga is really not about creating flexibility it is more about learning to relax the body and mind enough for the body is able to lengthen and loosen up. Shaking is a good thing, pain is a bad thing. Most yoga classes at a place (gym, studio, etc) are 50-60 minutes or longer. You can find shorter and longer ones on YouTube, or anywhere that you can find fitness videos. Search for yoga for flexibility, as there are several kinds of yoga; some to increase strength, focus, meditation, and/or relaxation, among other things.